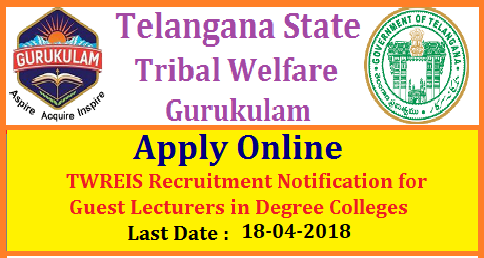 In TS Gurukulam Degree Colleges,TTWREIS Guest Faculty Part time Lecturer in TTW Residential Degree Colleges for Telugu,English,History,Economics,Political Science, Mathematics, Physics, Chemistry,Statistics,Computer Science,Electronics,Botany,Zoology,Micro Biology,Bio Technology, Commerce Subjects,TTWREIS Degree Lecturer Guest Faculty Online Application released @ tgtwgurukulam.telangana.gov.in,online Application,Fee Details,Last Date,Notification,Age Limit,Salary Details,How To fill Online Application,Address etc covered in this article. 1) Telugu 2) English 3) History 4) Economics 5) Political Science 6) Public Administration 7) Mathematics 8) Physics 9) Chemistry 10) Computer Science 11) Botany 12) Zoology 13) Micro -Biology 14) Commerce. Candidates having Masters Degree (i.e., M.A / M.Sc / M.Com./ M.C.A./M.Sc. (Comp. ))/ M.Tech(Comp.Sci.) With a minimum of 55%, in case of SC/ST, 50% of marks in the relevant Subject are eligible to apply. Weightage for Post Graduation - 50% weightage would be given for marks secured in P.G. Weightage for additional Qualifications - Candidates with NET/SET and Ph.D. shall obtain 30 marks for the additional qualifications. have to perform all the Residential pattern duties assigned to them by the Principal/ Head Office. Women Guest Faculty/ Part time Lecturer may be posted to Women’s and Men’s Colleges. Men Guest Faculty / Part time Lecturer shall be posted to Men’s Colleges only. Merely applying for the post shall not entitle the candidates for any claim to the Guest faculty/ Part time Lecturer position without following the selection procedure. Please inform the selection of guest faculty for maths.